I started my 5k running group yesterday at 6 a.m. and I can definitely say I like LOVE it! I woke up before the alarm and was out the door on my way by 6. For someone who is not a morning person, that’s an accomplishment! Approximately 25 of us met to train to either walk, jog or run a 5k. I stayed with the beginner runner group. After a 5 minute warm up, we began running 1 minute, then walking 1 minute for 3 miles. It was a windy morning, so I had trouble keeping up with the runners. Who knew that a little wind, would make it so hard! I kept up the intervals as long as I could, then walked the rest. I was a little disappointed that I couldn’t keep up with the runner group, but there’s no shame in walking. One thing I did notice, was my mood for the rest of the day. I had more energy than I usually have. I was happy, almost cheerful. I didn’t experience the 3 p.m. slump I usually get (where I attack the candy dish in the office). I’ve always heard that morning workouts are great for energy, but was surprised at how much this was true! 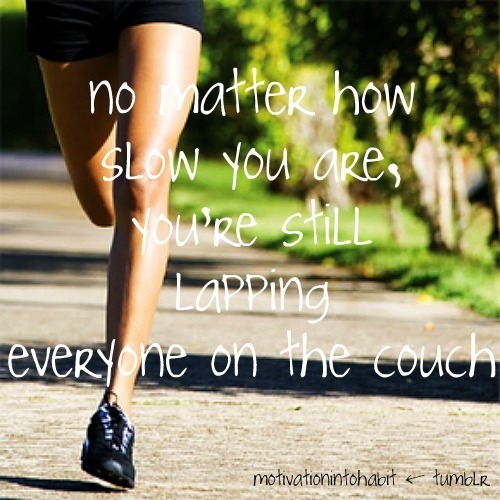 I’m looking forward to Wednesday, for day 2 of the running group! Great job Gina!! I have found that when I train in the morning I have a better workout. Also, if I wait until the afternoon or the evening I seem to miss more workouts because I tend to let the day’s events distract me from actually doing my workout. I like to get my workout completed in the morning and then get on with my day.